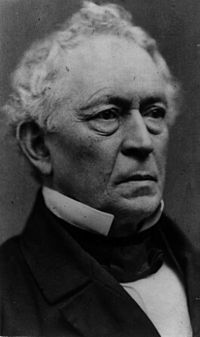 Edward Everett (April 11, 1794– January 15, 1865) was an American politician, religious leader and educator from Massachusetts. He was a Whig. He served as U.S. Representative, and U.S. Senator, the 15th Governor of Massachusetts, Minister to Great Britain, and United States Secretary of State. He also taught at Harvard University and was as president of Harvard. He was the Vice-Presidential candidate of the Constitutional Union Party in 1860. He gave a long speech at Gettysburg right before Abraham Lincoln. When Abraham Lincoln became president, the Civil War broke out. Everett had been calmer about slavery, but he was a strong Unionist. He worked hard to raise support for the Union through speaking in public. In November 1863, when the military cemetery at Gettysburg, Pennsylvania was dedicated, Everett was the main speaker. His two-hour speech was before the much shorter, but now more famous Gettysburg Address by President Lincoln. Everett was moved by the short speech and wrote to Lincoln, "I should be glad if I could flatter myself that I came as near to the central idea of the occasion, in two hours, as you did in two minutes." "Edward Everett". harvardsquarelibrary.org. Retrieved 6 May 2010. "Works by Edward Everett". gutenberg.org. Retrieved 6 May 2010.